Unique entertainment unit made in Portugal matching our popular Premium Bedrooms. 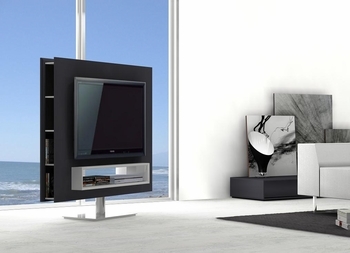 This TV unit is on a class of its own for many reasons. It features a swivel option giving you flexibility for placement in your home! The storage is amazing, giving you options on the front, for media units, as well as on the sides with 4 shelves each. The Braga collection comes in a rich grey high gloss lacquer finish.